Escargot stuffed mushrooms are simple yet fancy appetizers that have many variations. The elegant amuse-gueule is a small savory item perfect for serving before a main course or as a party hors d'oeuvre. Escargot is snail and is a delicacy often associated with French cuisine; although, you will find escargot in Italian and Spanish recipes as well. Snails were favorite edibles of the wealthy Greeks and Romans; they were introduced to the French when Cesar invaded Gaul. The most common cooking method for snails is steaming or boiling and they are typically served with a garlic butter or wine sauce. Adventurous diners may enjoy the snails boiled or steamed on a plate alone, but mushrooms stuffed with escargot may be more visually appealing to some. Texture is a major concern for those trying the delicacy for the first time. 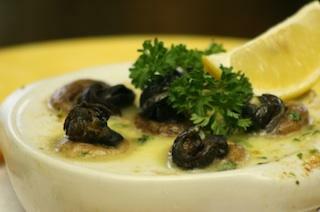 When prepared correctly, escargot is not slimy or rubbery; it is slightly chewy with a delicate, earthy flavor. Snails are a wonderful ingredient for mushroom appetizers because they take on the flavor of other ingredients. The two primary ingredients for escargot stuffed mushrooms are snails and mushrooms. Canned escargot is available through a number of retailers and you may find it in local grocery stores or gourmet shops. Online, some gourmet websites like igourmet.com, sell the delicacy. Selecting the mushrooms for the appetizer is an important step and there are many types of edible mushrooms to consider. However, common white mushrooms and crimini mushrooms are ideal for stuffing after their stems are removed. Portabella mushrooms are a meaty alternative to consider as well. Preparing mushroom stuffed with escargot can be very simple, but it is important to avoid overcooking the snails to prevent a rubbery texture. Begin by washing the mushrooms and removing their stems.Melt butter or olive oil in a skillet and add the finely minced fresh garlic. Sauté for a few minutes before adding the snails. Canned snails contain liquid and some recipes call for draining the liquid while others encourage you to add it to the sauté. Add white wine, Worcestershire or other liquid ingredients that you choose for your recipe. Do not boil. Arrange the mushroom caps divot side up and place 2 or 3 snails in each cap, depending on their size, after adding cheeses, vegetables and herbs. Sprinkle bread crumbs or hard cheeses on top. Bake at 350 F for about 45 minutes; the mushrooms should release their liquids when the appetizers are done cooking. Stuffed mushrooms are traditional appetizers that can be surprisingly simple to make. Adding a delicacy like escargot is an elegant choice that is certain to leave a flavorful impression.